Despite almost 20 years working in the IT industry, I made my first visit to Silicon Valley last week for a series of meetings both in the Valley and in Reno, Nevada. Up until recently, most of my roles have been focussed on either the ANZ or Asia-Pacific markets, so the opportunities to travel to the US have always been limited. 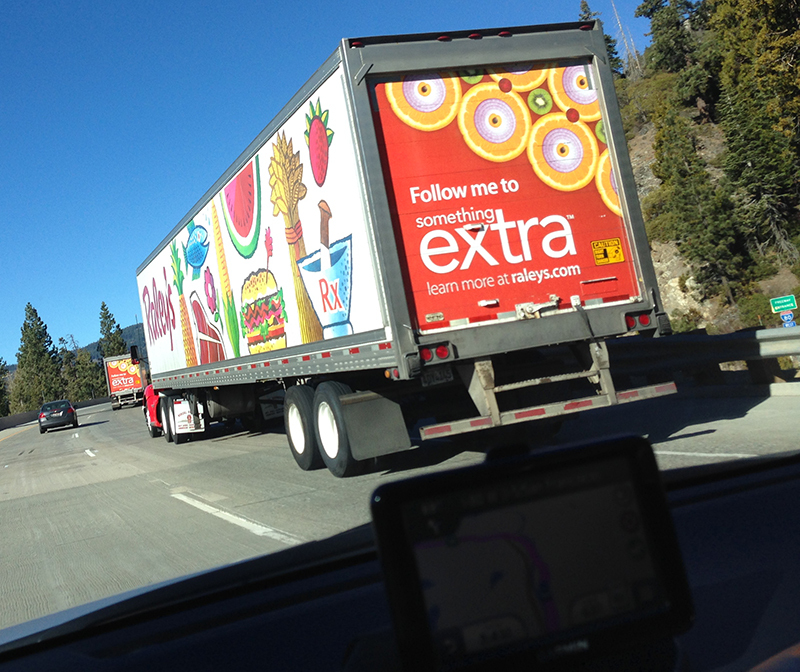 There were three things that struck me during my stay in the US – the prominence of the IT industry across all forms of media; why it’s a good thing that we don’t have direct-to-consumer pharma advertising here; and a glimpse of a form of marketing I’ve never seen before: ‘convoy advertising’. Thinking about the prominence of IT in the US, in Australia we probably don’t appreciate just how important IT businesses are to the US economy. Silicon Valley itself is like an industrial estate on a massive scale, where the best way to navigate is by using the IT logos on buildings to get your bearings. Driving around San Jose, Santa Clara and Sunnyvale, you get a sense of just how big this industry is by the size of the office complexes and the familiarity of the IT brands attached to them. Also, most of the professional sporting teams have IT companies as major sponsors; airports and television are full of IT advertising; and a significant proportion of Californian mainstream news media is devoted to reporting on the IT industry. The second thing that stood out as different was pharmaceutical product advertising on US television. This ‘direct-to-consumer advertising’ for pharmaceuticals has long been banned in Australia and, according to Wikipedia, is currently only permitted in NZ and the US. To be honest, I can’t understand why pharma companies would want to advertise on television. It’s very hard to downplay the possible harmful side effects of a drug in the small print when you have to include it in the voiceover content of the ad – and it seems that you can’t whisper those side effects, or speak them very quickly! Most of the ads would put me off ever using that drug, despite its benefits. You can see some good examples of these ads, compiled in mid-2013, on YouTube. Finally, on my trip from Reno back to San Francisco, I passed a marketing execution I hadn’t seen before. Searching on the web, I couldn’t find any other examples of it, so I wonder if it’s something completely new. If it is, I’m coining the term ‘convoy advertising’. 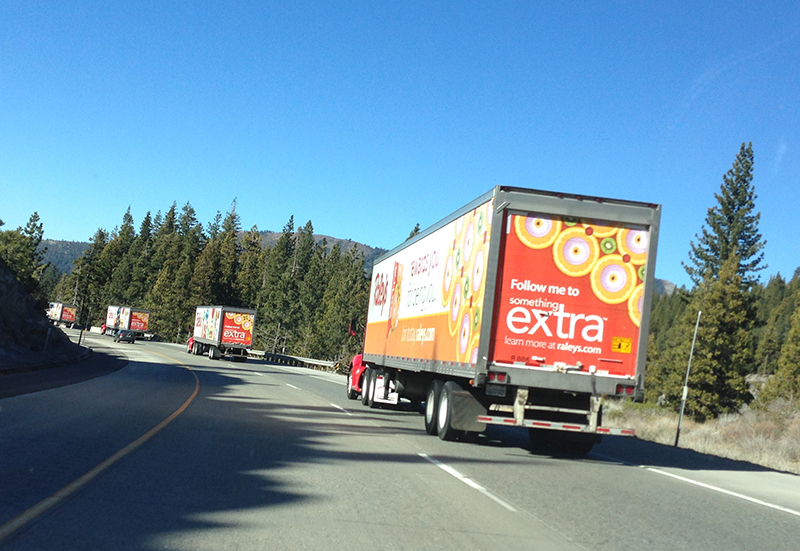 I passed a convoy of six or seven trucks travelling well below the speed limit, all identically kitted out in the branding of the supermarket chain Raley’s, promoting Raley’s reward card, Something Extra. It seemed to be a very effective way to promote a new product or service, especially when the trucks were probably transporting goods at the same time. Over here, I’ve always liked transport company Linfox’s ‘You are passing another Fox’ message on the back of all its trucks, but I’ve never seen this form of convoy advertising before. I can see some really great applications for this form of promotion in Australia – especially on the Sydney to Melbourne route!